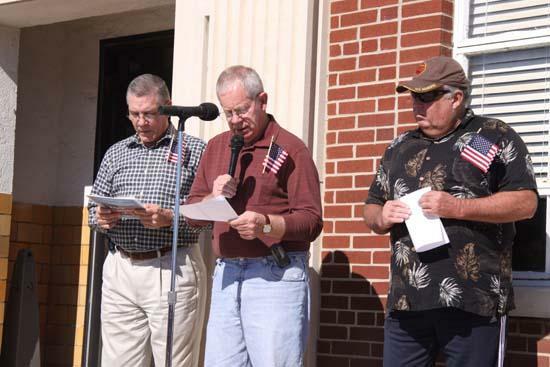 From left, Dr. William (Bill) Jennings, Woodbury Mayor Harold Patrick, and Tommy Woodson read the names of the 61 Cannon County veterans who lost their lives at war. For the 18th consecutive year, Cannon County honored its fallen war heroes by reading the names of the 61 veterans who lost their lives at war through the years during a ceremony on the Courthouse lawn Thursday morning at 11. The 15-minute ceremony included the reading of names, presentation of the colors, and music. Lest we forget.... Freedom isn't free. Thanks to all our Cannon County Veterans and to those who paid with the supreme sacrifice. I would like to say Thank You to all our Veterans, and please know that you are appreciated! late in the evening on Veteran's Day I heard from a soldier who told me that our son (1LT Walkup) saved his life the day he died. I am sure that many of the others whose names are engraved on the monument performed heroic deeds as well, and for them our counrty is forever in debt. Never Forget!